Listen up, lighten up. I spent four months in new vocal territory, nearly two octaves below my normal range. I did not renounce my high notes; in fact every day I balanced my head and chest registers with vocalises, sirens, and arpeggios. Then I mixed the ranges and practiced a light belt. Just what I tell my students to do! Despite that, my first two music rehearsals were awful. I had listened to my Lovett model, Patti Lupone, a little too much and I made the classic mistake of trying to carry a Patti-esque heavy chest register sound too high. I recorded those early rehearsals and when I forced myself to listen to them, I heard how wrong it was. Imitate the originals. No other character in the show had to talk like I did. I finally asked an actor friend and he said, “Just watch the Sondheim videos and rip them off,” so that’s whut ah deed. Halfway through rehearsals no one could understand a word of my Cockney accent, so I pulled back a lidl. Be a hypochondriac. It never left my mind that I had no understudy or swing to play Mrs. Lovett if I couldn’t. In previous semesters I might have had a sniffly student risk a lesson; this time I banished them immediately. I did get the sniffles a couple of times during the run, but everyone in the cast stayed remarkably healthy for the six-week run. Learn your lines 75 times. 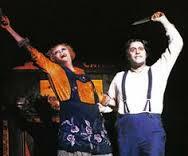 The Sweeney Todd score is almost 400 pages; that’s basically an opera. I read an interesting article by a professional opera singer who said that he only felt comfortable with a role when he had rehearsed his part 75 times. He even made a chart to show how the material sank in superficially for the first 25 go-rounds, then went deeper after that. Sure enough, Mrs. Lovett’s music got easier to manage when I knew I was above 40 repetitions. By the time the show opened I was operating on almost pure muscle memory, which was necessary in a show with so many words spitting out so fast. Many times during the run I would have a momentary brain fade and worry the words wouldn’t come. They always did, a split second before I needed them. Normal is good. Many productions of Sweeney Todd turn Mrs. Lovett into a grotesque, with ill-fitting rags for costumes and heavy, messy makeup (see above). She comes off as unattractive and unlovable. I was so relieved when my costume, hair and makeup turned out to be normal! I thought it made the character’s arc all the more shocking. Bad is good. With the glorious exception of The Queen Of The Night, most of my roles have been good girls doing good deeds. It was delicious to be on the dark side! Even better, director Christopher Simpson helped me create a Mrs. Lovett who was just really practical. I called Mrs. Lovett’s actions “ordinary evil”— everything she did made perfect sense to her. Enjoy face to face opera. Jason and I were opera singers with little experience of singing in a small theater like the CTC. We started out playing our characters broadly, because that’s just what you do in opera and it’s what we had seen in other productions. We sang to the house and cheated out, and made big gestures. Chris reined us in, little by little. He encouraged us to talk instead of declaim, and make small movements instead of grand ones. Unamplified opera singers rarely get the chance to perform this way! I whispered a punch line into Jason’s face each night, and each night it got a laugh — because it was audible! We couldn’t believe it. "They heard it!" Photo by Seth Jacobson. Break new ground. The Contemporary Theater Company’s version of Sweeney Todd was intimate, entertaining, and appropriately bloody. To build tension throughout the show, Chris directed us to avoid applause at all costs; that was a first for me but I grew to love it. Our production should also noted for one unexpected discovery: A seduction scene. I’d never seen "A Little Priest" played that way, anywhere, but it now makes total sense. Stephen Sondheim should be informed that we figured it out. For the uninitiated: "Priest" follows Sweeney’s furious declaration that he will kill at whim while he waits for the evil Judge to show up. Mrs. Lovett wonders how they will dispose of his first victim, Signor Pirelli, who’s stuffed in a trunk upstairs. Little by little they get the idea to cut up Pirelli’s body and sneak it into her meat pies. As Mrs. Lovett pantomimes making pies out of people, she names their vocations; the first named pie is Priest. Their enthusiasm grows throughout the song. We blocked it quickly, throwing in a bit of waltzing and plenty of stage laughter at our characters’ corny jokes, ending triumphantly with a razor in Jason's hand and a rolling pin in mine. We were doing what we had seen every other Todd and Lovett do. But Chris was frustrated. “The scene doesn’t go anywhere,” he said. “It’s the same thing over and over. They're happy about the pie business. We know that immediately.” "Really?" I said. "I thought Mrs. Lovett was happy because she was going to sleep with Mr. Todd right after the song is over." Eyebrows went up. “Really?” said Chris. “Really?” said Jason. “Really?” said Jean, the music director. I pointed to Mrs. Lovett’s lines in Act Two, referring to rumpled bedding and getting married to legalize things. “She's happy for a reason," I said. We tried again. This time, the oven door flew open and did some foreshadowing. The humor stayed, but punch lines had been transformed into come-ons and rejections. Mrs. Lovett wielded Sweeney's razor like a tractor beam. And "executioner" became the very opposite of a safety word. We laughed, because we realized that every. single. line. could be delivered as a double entendre. Sondheim wrote it that way, but why hadn’t anyone played it that way? To all of us it was obvious, funny, dark, and correct (you can see the bootleg here.) "Priest" influenced my performance in the rest of the show as well. My Mrs. Lovett was a practical, passionate woman who was head over heels for Mr. Todd because he got her heels overhead. Over to you, Stephen. Be grateful. Nellie Lovett is a role to . . . die for. She is Lady Macbeth in an apron. I’m thrilled that I got to play such a sinister, saucy low-range role, in such an intimate space, surrounded and supported by top-notch performers, in front of family and friends who were a bit surprised. I'm glad so many of my students took the time to see their teacher perform. I learned that I'm capable of more than I thought I was. Where's the next lesson? Bright ideas just pop into me head, and I keep thinking . . . .